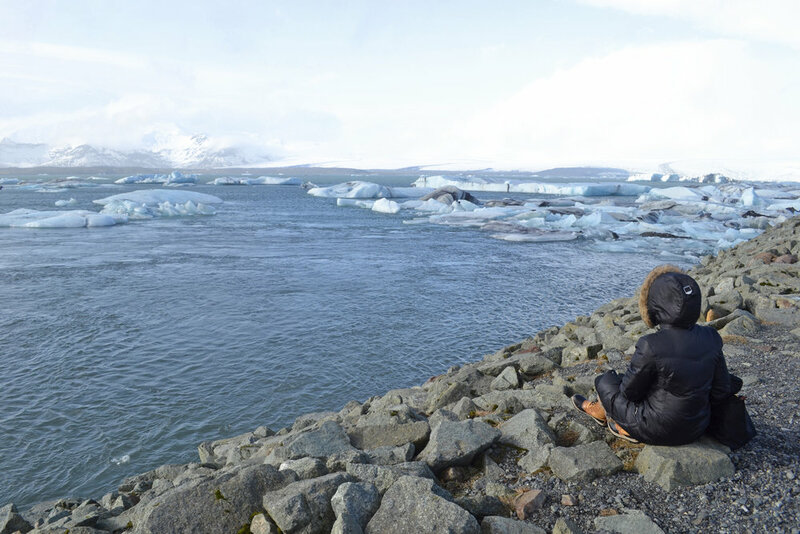 I'm so excited to finally start sharing posts on our amazing trip to Iceland. While we only went for a long weekend, we felt like the entire experience was incredible and it's by far one of the most beautiful places I've ever been to. For us, it was a girls weekend for me and one other friend. We had travelled together before (to a much warmer place) but knew we were good traveling buddies and we would have a fun long weekend in store. We tried our luck with WOW Air, a budget airline that has made it's name as a result of it's low fare flights to and from a few different US and European cities to Reykjavík. We flew from Newark on a 6:35 PM red eye flight that arrived at 4:40 AM. I've done my share of red eyes to Europe but this was like no other. 4:40 AM felt like 12:40 AM, just in time for bed at home and a new day in Iceland. We took a bus from the airport to our hotel and got really lucky with a room ready by about 8:30 in the morning. We dozed in the cozy hotel lobby while we waited and I made a quick trip to the most amazing bakery, Sandholdt for a delicious pastry that gave me energy for about 30 more minutes. I'm not usually one to do this but we took about a two hour nap and woke up at 11AM like new people - ready to explore the city. Our first stop was for coffee at a little coffee place called Reykjavík Roasters that had the most delicious and much needed coffee. From there we were a short to Hallgrímskirkja church which is probably the most famous building in Reykjavík with it's beautiful views of the city. The architecture of the building is really wild especially considering when it was built - it's so modern for that time period! The view is definitely the best of the city so it's worth it to take the trip up. The weather really took a turn for the worst after Hallgrímskirkja which is kind of expected in Iceland (more on that in my tips post!) We tried to dodge the rain going in and out of stores on Laugavegur, Reykjavík's main shopping street. A few of our favorites was this cute little Christmas shop, Litla Jólabúðin, where I got an Icelandic horse Christmas ornament (one of my favorite things to do on trips is buy ornaments everywhere we go if possible! ), Vínberið, a tasty sweet shop, and Myconceptstore, a really unique home goods store. Our sweet breakfast wearing off at this point, and being a little wetter than we would have preferred, we had a late lunch at Messinn. This was one of my favorite meals in Iceland. The food is so authentic and tasty - I could have eaten every meal here! After lunch and a glass of wine we wandered around a bit more in the city and wound up at Micro Bar for some tasty beer tastings. A few local beers but and all delicious. The bar is a bit outside of the main part of town surrounding Laugavegur Street, but nothing is too far so it was easy to walk home. We made one last stop for a drink in town off the main street and ended up back home at a respectable hour stuffed from our late lunch and very ready for a good night sleep. Stay tuned for Part 2 and 3 of our Icelandic adventure!